For someone who has held the Clintons in disdain for 25 years, I did not believe I could be stunned by any activity in which they participated. Still, you read Clinton Cash by Peter Schweizer and you sit there slack-jawed. Is there nothing these people will not stoop to? The introduction defines Schweizer and the creditability of the book. His two most recent books before this were Throw Them All Out: How Politicians and Their Friends Get Rich off Insider Stock Tips, Land Deals, and Cronyism That Would Send the Rest of Us to Prison and Extortion: How Politicians Extract Your Money, Buy Votes, and Line Their Own Pockets. Two clear attacks on the bipartisan graft and crony capitalism being done at the highest levels of our federal government. His manuscript for Clinton Cash was provided to investigative reporters at The New York Times, Washington Post, ABC News and FOX News. This was an obvious effort to diffuse the anticipated onslaught from the Clintons and their cronies and to a great extent establish the integrity of his findings. Clearly he was not some anti-Clinton wacko as he would soon be branded by the Clinton flock. The NYT and WP took parts of the book and exploded them into bigger stories of Clinton corruption. The book is so rich with material of questionable or illegal activity that even Schweizer blew right by something that was blatantly illegal. He was reviewing the relationship between Bill Clinton and the most notorious person from the book, Frank Guistra, a Canadian businessman. Clinton often flew on Giustra’s private plane. Schweizer mentions in passing that Clinton used the plane to attend campaign events for Ms. Clinton in 2008. Well, that is an in-kind contribution to a political campaign -- and from a foreigner. That is blatantly illegal, if Schweizer is correct. He was so overwhelmed with the Clintons’ activities Schweizer never even cited the illegality. The book did disclose that Clinton accomplished something as secretary of state, which was a revelation. She decided to take over the secretary of commerce’s job helping American companies do business in foreign countries. This proved the Commerce Dept. does not need to exist, but that wasn’t the purpose of her work. As always with the Clintons, there were strings attached for their help. Boeing cut a $3.7 billion deal with Russia with Ms. Clinton’s help and magically a $900,000 donation showed up at the Clinton Foundation. Then there is the fact that Clinton used the Foundation and State Department as an employment center for their minions. But Hillary could not live with that because her people could not make enough money as federal employees so she allowed them to do outside work (when did these people sleep?). If you are granted Special Government Employee (SGE) status, you can work outside the government for a period of 130 days. That was abused by Clinton and her favored aides such as Huma Abedin and Cheryl Mills. Their attempt to hide this was so disconcerting that even the left-wing ProPublica had to file a Freedom of Information Act (FOIA) request and the State Department came back and complained about having to do too much work to collect the info. 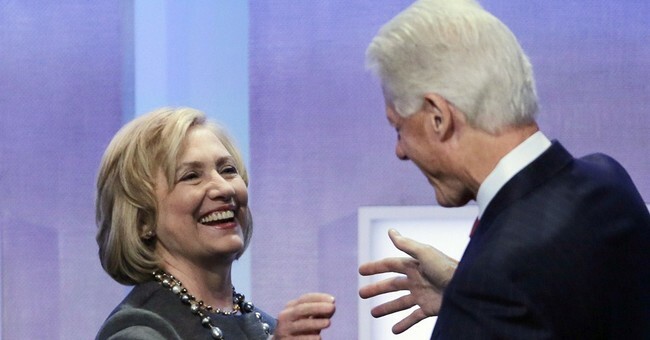 The Clinton Foundation has been rated to varying degrees by independent organizations. Part of the problem is its unusual model. Charity Navigator could not even rate the Clinton Foundation, citing its structure. With the thousands of charities that exist, one can easily question why this entity which should be pristine is so peculiar that it does not meet normal models of American charities. The Clintons have said that if Ms. Clinton wins, and only if she wins, they will stop taking foreign and corporate contributions. That leaves many problems, of which I would like to describe three. 1) This policy opens up the foundation to a rush of questionable contributions from the time of the announcement until they make the change. 2) Wealthy individuals still have the ability to buy influence from the Clintons from their own bank accounts. 3) Foreigners can shuttle cash to American citizens and disguise things that way. Related entities to the Clinton Foundation will not be restricted from taking monies from corporations or foreigners. Whoever knows with the Clintons when they say “stop taking certain donations” really means to stop. The only acceptable thing is to shut down this operation which is only a shill for the Clintons and all their cronies. If they want do charity work, they can become the face of fundraising for the Salvation Army. You already know this, but the Clintons do everything for themselves and their team. Hillary is crisscrossing the country flailing at an attempt to tell people how she is the real candidate who cares about their wants, needs and desires. Make no mistake, there were payments directly to Bill and Hillary Clinton for deals they engineered on others' behalf. That is called pay for play and blatantly illegal. My question, which I have had for ages, is: Why would you vote for this circus?